December 1940. 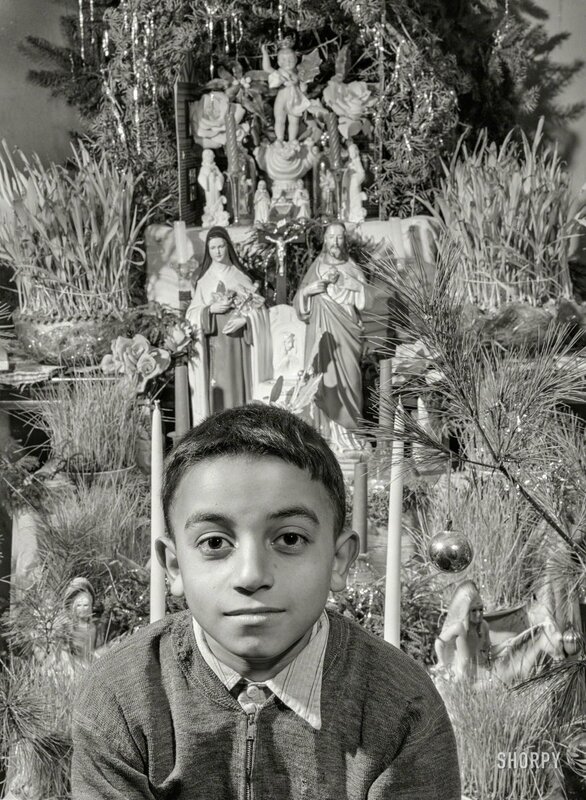 "Manuel Andrews, a Portuguese boy near Falmouth, Massachusetts. Family runs a seven-acre vegetable farm and have one 'new' cow of which they are all very proud. Father is a laborer in an Army camp nearby. Shot was taken just after Christmas." The tree decorated with ceramic figures of Mary, Joseph and Geronimo. Acetate negative by Jack Delano. View full size. Submitted by zvbxrpl on Wed, 11/28/2018 - 2:44pm. The Portuguese contingent continues very strong in New Bedford, Fall River, and the surrounding area (including Falmouth). Some famous people of Portuguese (or part Portuguese)descent from the region include the chef Emeril Lagasse and disco dance kings Tavares (originally Chubby and the Turnpikes). Some of the best food ever, too, including amazing bread. Submitted by davidk on Wed, 11/28/2018 - 7:15am. This kid has hair like one of my younger brothers. No matter how much he used to wet and comb and try to smash down his hair in front, it always refused to behave and popped right back up in a crazy wave at the hairline, off center. Submitted by Sals on Wed, 11/28/2018 - 7:14am. Portuguese were apparently a large presence in the region. Come on, Shorpy sleuths, what more can you tell us? Submitted by Commishbob on Wed, 11/28/2018 - 1:41am. I saw the name and had to quickly check the date of the photo. My grandfather, also Portuguese, was named Manuel Andrews and he grew up (decades earlier) across the bay from this boy's home, in New Bedford. I wonder if this young name acquired his surname in a similar fashion to my grandfather, from an Ellis Island clerk who thought 'Aldrate' wouldn't do. 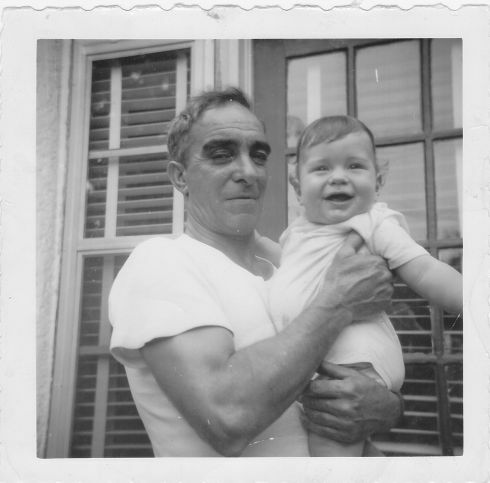 Here he is, holding yours truly, in May, 1953. Submitted by alrich on Tue, 11/27/2018 - 3:07pm. Mary and Joseph and the baby Jesus are in the small nativity scene above the crucifix. The larger figures are Saint Theresa of Avila (Spain) and the Sacred Heart of Jesus. Geronimo, as an Apache, wasn't usually depicted with a headdress, but it could be.